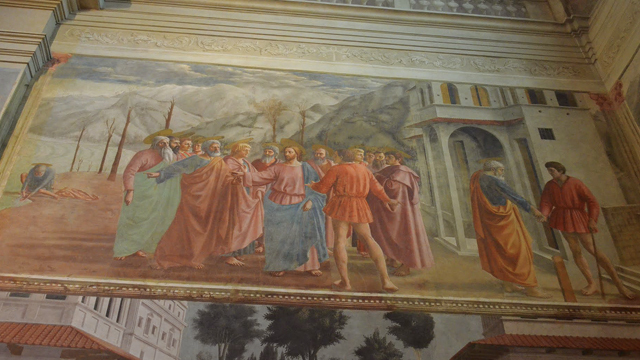 Stretching my artistic boundaries in Florence, I explore a lesser-known Brancacci Chapel and the frescoes of the unheralded and massively influential Masaccio. This story was originally printed in a custom travel publication for Wells Fargo. Standing in the hushed and dimly lit Brancacci Chapel in Florence last August, I could only stare and wonder: How did I not know this guy? How, in the name of Italian renaissance art, had I, after decades of amateur study, missed the pioneering influence of one young 15th-century painter named Masaccio? There are reasons, I suppose, like lingering on favorites at the expense of recognizing a central inspiration behind the artists I loved best. You see, in all my travels to Italy, I’ve been drawn time and again to the masters of the high renaissance, the guys whose greatest hits are known even to those who wouldn’t know a fresco from a can of Fresca. Like Leonardo and his famous dinner scene. Or Michelangelo and his fabulous ceiling. Their stories and rivalries in the early16th century I know well. But there were gaps in my historical knowledge brought on largely by my own choices: to understand Leonardo and Michelangelo better, I chose to go deeper, focusing my time in Italy on returning to their monumental achievements. That’s just what I found myself doing during a recent visit to Florence. But in doing so, I got annoyed. I had to alter my plans. And before you knew it, I was gaining profound insights into my renaissance heroes. Let me explain. In the decade since my last visit to Florence, the Tuscan city seemed somehow changed. Still crowded, yes, but now more chaotic, less charming. As I elbowed my way around the David, through the Medici Chapel and past the Annunciation – true magnets for devotees of Michelangelo and Leonardo – I sensed a fundamental error in my strategy. My treasures were the city’s most obvious treasures. Tour guides, their umbrellas raised, guided their hordes like cattle to the very spots where I wanted to stand quietly and ruminate. No chance. So I scanned my guidebook and spotted an attraction I had ignored before. On the south side of the Arno, it had seemed too far, too obscure to bother with. A small chapel decorated in the 1420s by a guy whose name I barely knew? It was 100 years outside my historical sweet spot. I passed then. But this time, hemmed in and impatient, I stretched my boundaries, geographically and artistically. When I reached the Brancacci Chapel, inside the Church of Santa Maria del Carmine in the little-traveled Oltrarno neighborhood, a few people were already there, rapt in their silence and attention. They weren’t just viewing this astonishing, world-changing set of frescos, they were absorbing them. Just one look at one panel – an agonized and naked Adam and Eve weeping and wailing as they walk from the Garden of Eden – offered an epiphany. Nearly 600 years old, it would look no different if it were painted today. My renaissance heroes, Leonardo and Michelangelo, had once stood where I was standing, Visari noted. They had stared at the same panels. They saw the bridge Masaccio constructed. And thus inspired, they strode across it to further greatness. They knew. Now I knew. This entry was posted in Travel and tagged Brancacci Chapel, Florence, Italy, Masaccio, Renaissance art on January 13, 2013 by Justin Catanoso.